Many terpenes are derived commercially from conifer resins, such as those made by this pine. Terpene is any of a large and varied class of hydrocarbons, with the molecular formula (C5H8)n, that are produced by a wide variety of plants, such as conifers. Terpenes also are produced by some other living organisms, such as swallowtail butterflies, which emit terpenes from their osmeterium, and a fungus isolated from St. John's Wort. The term "terpene" at times is used broadly to also include the terpenoids, which are terpenes that have been chemically modified, such as through oxidation. Terpenes, as well as terpenoids, are the primary constituents of the essential oils of many types of plants and flowers, such as citrus fruits. 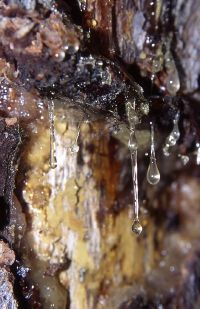 Terpenes are the major components of resin, as well as turpentine produced from resin. In addition to their roles as end products in many organisms, terpenes are major biosynthetic building blocks within nearly every living creature. Steroids, for example, are derivatives of the triterpene squalene. Carotenoids are terpenoids and a number of these can be made into vitamin A.
Terpenes provide a number of valued functions for the living organisms that produce them, in addition to being building blocks for other molecules. Some are used to attract pollinating insects, for example, or provide a defense mechanism by attracting animals, such as mites, that feed on herbivores. Plant terpenoids are used extensively for their aromatic qualities. Terpenoids contribute to the scent of eucalyptus, the flavors of cinnamon, cloves, and ginger, and the color of yellow flowers. Well-known terpenoids include citral, menthol, camphor, Salvinorin A in the plant Salvia divinorum, and the cannabinoids found in Cannabis. Terpenes, as a constituent of essential oils, have long been used in human culture. Essential oils are employed widely as natural flavor additives for food and as fragrances in perfumery. Synthetic variations and derivatives of natural terpenes and terpenoids greatly expand the variety of aromas used in perfumery and flavors used in food additives. Likewise, terpenes play a role in traditional and alternative medicines, such as aromatherapy, and are under investigation for antibacterial, antineoplastic, and other pharmaceutical functions. Terpenes are derived biosynthetically from units of isoprene, which has the molecular formula C5H8. The basic molecular formulae of terpenes are multiples of that, (C5H8)n, where n is the number of linked isoprene units. This is called the isoprene rule or the C5 rule. The isoprene units may be linked together "head to tail" to form linear chains or they may be arranged to form rings. One can consider the isoprene unit as one of nature's common building blocks. As chains of isoprene units are built up, the resulting terpenes are classified sequentially by size as hemiterpenes (one isoprene unit), monoterpenes (two isoprene units), sesquiterpenes (three isoprene units), diterpenes (four isoprene units), sesterterpenes (five isoprene units), triterpenes (six isoprene units), and tetraterpenes (eight isoprene units). When terpenes are modified chemically, such as by oxidation or rearrangement of the carbon skeleton, the resulting compounds are generally referred to as terpenoids. Sometimes referred to as "isoprenoids," terpenoids likewise are derived from five-carbon isoprene units and can be thought of as modified terpenes, wherein methyl groups have been moved or removed, or oxygen atoms added. Some authors will use the term terpene to include all terpenoids. Just like terpenes, the terpenoids can be classified according to the number of isoprene units used, such as monoterpenoids (two isoprene units), sesquiterpenoids (three isoprene units), diterpenoids (four isoprene units), and sesterterpenoids (five isoprene units). These lipids can be found in all classes of living things, and are the largest group of natural products. The name "terpene" is derived from the word "turpentine." Turpentine is a fluid obtained by the distillation of resin obtained from trees, mainly pine trees. It is composed of terpenes, mainly the monoterpenes alpha-pinene and beta-pinene. The word turpentine is formed (via French and Latin) from the Greek word terebinthine, the name of a species of tree, the terebinth tree, from whose sap the fluid was originally distilled (Barnhart 1995). Terpenes may be classified by the number of terpene units in the molecule; a prefix in the name indicates the number of terpene units needed to assemble the molecule. A single terpene unit is formed from two molecules of isoprene, so that a monoterpene consists of one terpene but two isoprene units. Monoterpenes consist of two isoprene units and have the molecular formula C10H16. Examples of monoterpenes are: Geraniol, limonene, and terpineol. Sesquiterpenes consist of three isoprene units and have the molecular formula C15H24. An examples of a sesquiterpene is farnesol. The sesqui- prefix means one and a half. Diterpenes are composed for four isoprene units and have the molecular formula C20H32. They derive from geranylgeranyl pyrophosphate. Examples of diterpenes are cafestol, kahweol, cembrene, and taxadiene (precursor of taxol). Diterpenes also form the basis for biologically important compounds such as retinol, retinal, and phytol. They are known to be antimicrobial and anti-inflammatory. The herb Sideritis contains diterpenes. Sesterterpenes consist of five isoprene units and have 25 carbons, C25H40. They are rare relative to the other sizes of terpenes. The sester- prefix means half to three, in other words, two and a half. An examples of a sesterterpene is geranylfarnesol. Tetraterpenes contain eight isoprene units and have the molecular formula C40H64. Biologically important tetraterpenes include the acyclic lycopene, the monocyclic gamma-carotene, and the bicyclic alpha- and beta-carotenes. Terpenes are the most structurally diverse and numerous among plant natural products (Zwenger and Basu 2008). While often associated with conifers, they also are produced by flowering plants, and even various insects. Studies also have shown that the endophytic fungus isolated from St. Johns Wort (Hypericum perforatum) produces terpenes (Zwenger and Basu 2008). The resin produced by most plants is a viscous liquid, composed mainly of volatile fluid terpenes, with lesser components of dissolved non-volatile solids, which make resin thick and sticky. The most common terpenes in resin are the bicyclic terpenes alpha-pinene, beta-pinene, delta-3 carene and sabinene, the monocyclic terpenes limonene and terpinolene, and smaller amounts of the tricyclic sesquiterpenes, longifolene, caryophyllene, and delta-cadinene. The steroids and sterols in animals are biologically produced from terpenoid precursors. Sometimes terpenoids are added to proteins, such as to enhance their attachment to the cell membrane; this is known as isoprenylation. Carotenoids, organic pigments that are naturally occurring the chromoplasts of plants, belong to the category of tetraterpenoids—that is, they contain 40 carbon atoms. A number of carotenoids can be made into vitamin A in the human body (NIH 2018). Rubber is one of the most widely known terpenes, being a polyterpene. As with other plant essential oils, terpenes are major constituents of the essential oils of citrus fruits. However, they are removed before the essential oil is used for flavoring beverages and foods because they tend to produce undesirable tastes once they oxidize and polymerize. They are not the source of the characteristic flavor of citrus (Bender and Bender 2005). Barnhart, R. K. 1995. The Barnhart Consise Dictionary of Etymology. New York: Harper Collins. ISBN 0062700847. National Institute of Health (NIH). 2018. Vitamin A: Fact Sheet for Health Professionals National Institute of Health, Office of Dietary Supplements (ODS). Retrieved March 22, 2018. Zwenger, S., and C. Basu. 2008. Plant terpenoids: Applications and future potentials. Biotechnology and Molecular Biology Review 3(1): 1-7. Retrieved March 22, 2018. This page was last modified on 22 March 2018, at 20:38.